Arab League Chief Urges 'Confrontation' With Islamic State Militants : The Two-Way In apparent backing of the U.S., Nabil Elaraby tells the 22-member organization that it needs a "comprehensive confrontation" with the extremist group. Arab League Secretary-General Nabil Elaraby (foreground) speaks to the head of the Syrian Coalition (second from right) during a meeting in Cairo, Egypt, on Monday. 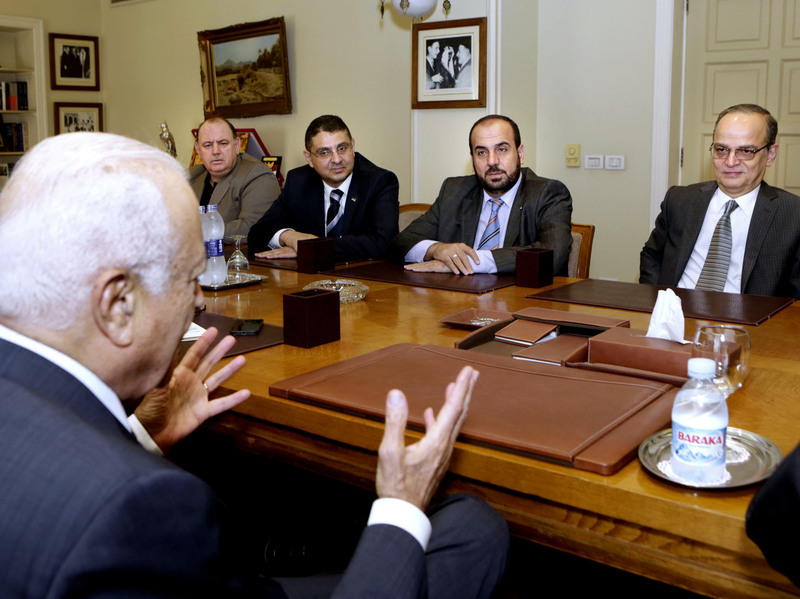 Elaraby is urging the league's members to confront Islamic State extremists. Arab League chief Nabil Elaraby is calling on the organization's members for a "comprehensive confrontation" of Islamic State extremists in Iraq and Syria in apparent support of U.S. plans to build a coalition to stop the militants. Elaraby said a "clear and firm decision for a comprehensive confrontation" was needed to confront the "cancerous and terrorist" groups in the region. The 22-member Arab League "could provide crucial support across the Middle East for [President] Obama's effort to assemble an international coalition against the Islamic State," The Associated Press writes. The Arab League includes Egypt, Saudi Arabia, Jordan, Lebanon, Qatar and the United Arab Emirates. Elaraby's comments come shortly after the U.S. stepped up airstrikes near the Haditha dam in Iraq's western Anbar province. They also come ahead of a vote on a new Iraqi Cabinet. "The leader of a pro-Iraqi government paramilitary force in western Iraq said the air strikes wiped out an Islamic State patrol trying to attack the dam — Iraq's second biggest hydroelectric facility that also provides millions with water.
" 'They (the air strikes) were very accurate. There was no collateral damage ... If Islamic State had gained control of the dam, many areas of Iraq would have been seriously threatened, even (the capital) Baghdad,' Sheik Ahmed Abu Risha told Reuters." President Obama told NBC's Meet the Press that he will address the nation Wednesday to outline a new approach to fighting the insurgency, but that it would not involve U.S. ground forces. Obama is expected to meet with congressional leaders Tuesday about the plan. "I just want the American people to understand the nature of the threat and how we're going to deal with it and to have confidence that we'll be able to deal with it," Obama told NBC. "A suicide bomber struck a meeting of Sunni tribal fighters and Iraqi security troops on Monday, killing 16. "In Monday's attack, the bomber drove an explosives-laden Humvee, apparently seized from the Iraqi military, into the gathering of a major Sunni tribe, the Jabour, and security forces in Duluiyah, some 80 kilometers (45 miles) north of Baghdad, a police officer said."